I've been considering building a CNC plasma table for some time now. I've finally got some funds together and am ready to pull the trigger.The problem is I don't know where to shoot. The research has just made me more confused as I learn more about ways to accomplish this.I'd like to collect the bits to get this built over my Christmas break from work. I'd like the table to be a 1200 x 1200. I will probably make it around 1300 x 1300. I'd love for it to be 2400 long, but just don't have the room. 1. Nema34 motors to drive the carriage (I'll use one each side). 3. sbr20 slide rails for the carriage and sbr16 for the other axis's. 2. What Breakout Board would be recommended for the Gecko G203V. 3. Is there a supplier somebody has had good luck with for Ball screws with machined ends? I'm sure I'll have plenty more questions. Questions before I buy a CNC Plasma table? NEMA34 might well be overkill, given that a plasma torch doesn't weight much, and it won't be meeting any physical resistance. Would 60V supplies work for you? They should be sufficient for the motor drivers, adn they're far easier to fidn than 72V supplies are. As for machined ball screws, I have had no real problems with Chinese-supplied ones from AliExpress - sure, it's far from being a 100% consistent source, but for the money (and provided you don't go for the cheapest of the cheap) it's hard to go far wrong. I'm not set on anything. I am used to overbuilding things, so this will be a real test to focus on light weight. I had thought about making this dual purpose as a router but have decided to build this soly as a plasma table and then build a router. I'd like to use that for aluminium so the designs were at odds I think. I'm just starting to redesign. I'd really like that nailed down in the next week so I can order everything. From what I have learned, it seems volts equals speed. The gecko drivers have a max voltage of 80V so I decided 72V would be good. If 60V is common I could make that compromise. Not a hard thing to upgrade in the future. Maximum speed needed for 1.6mm plate. I cant see myself using anything less than 3mm. Do you have a supplier on aliexpress you have used before? Send me a PM if you like. I'm in Australia and have been there done that. Good luck putting a design together and finding the gear in a week! I kinda think you are starting at the wrong end. Start with the motors you need to move the weight of your gantry then decide on the stepper controllers to use. I use 269 Oz NEMA 23's on the Z and X. I was going to use the same size on the two Y axis motors but I found these cool 5:1 timing belt drive reduction drives to suit NEMA 34's so I went with the smallest ones I could find so as not to blow the power budget. I'm using a 10 amp 48V Meanwell power supply. 1600mm HGR25 rails on the table and HGR15 on the gantry with rack and pinion drive. The gantry weighs about 30 kg. 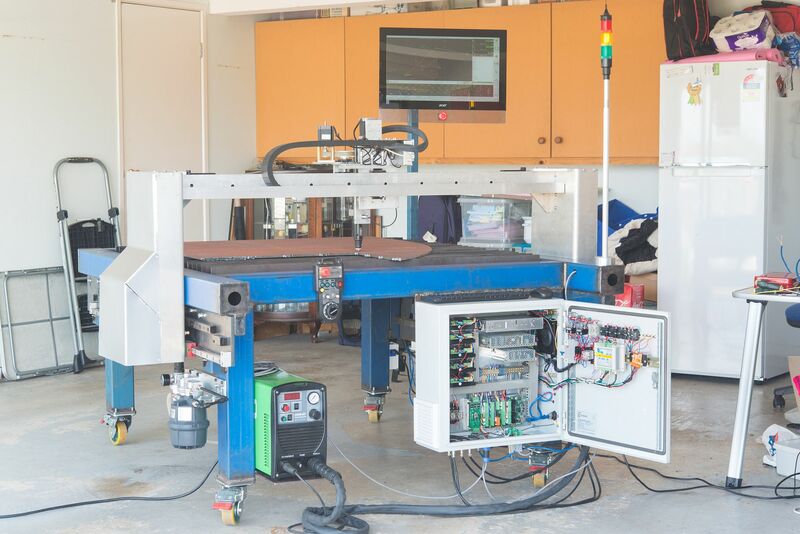 This machine runs at 21 metres per minute and uses LinuxCNC and a Mesa 7i76e ethernet board with a Mesa THCAD-10 voltage input daughter board. Do your homework and don't just go with a Mach3 option. Likewise, look around at stepper controllers. There are other options outside of Gecko that are much cheaper and have not missed a beat for me and a lot of others I know. Look at Steppersonline, ocean controls, Homan Designs and Alibaba/AliExpress. Noulei on AliExpress is a good source. I got my gearboxes there but I bought my rails elswhere at a better price (but then they went up in price) https://www.aliexpress.com/store/437307 Stepperonline hold stock in Australia and are good for warranty with a Sydney return address but some stuff ships (quickly) from China. Oh and also Power Supplies Australia for Meanwell power supplies..
Use low inductance NEMA23's. You want speed, not torque. Bigger steppers are generally poor at high speeds. Use 10mm pitch ball screws at the least, maybe higher. Mechanical resolution won't be your problem, slow speeds will if you use 5mm pitch screws. A rough rule of thumb for (low inductance NEMA23 anyway) is ~1000rpm is getting close to the limit. That's 5m/min max with 5mm pitch screws. (This is not a hard rule, but a good guide). 10mm pitch screws will double the speed. you haven't said anything about THC and if you want a professional cut then good THC is mandatory. What control software are you planning on and what will the hardware associated with that software support in terms of THC? I will definitely use THC. I've been considering the Compact 150 THC. I'm open to suggestions for software. I'm considering mach3 as there is a lot of online support for that, or maybe mach4. I'd prefer a windows compatible software as that is what I'm familiar with. So many choices. The more I investigate, the more things I have to consider. I was wanting to get the design done and built over the Christmas break. Now I'll just be happy to of come up with a design/system I'm happy with. I am also considering just doing this on the cheap with all chinese stuff and then swap out/upgrade as I go. Its getting a bit more costly than I imagined. I'll probably opt for a well known stepper controller though. unit but is very capable and high quality. to find it doesn't work properly and then have to buy another one.....that's expensive even if the first one is dirt cheap. It's OK, If you read my post you will see I said I'll go for a quality motion controller. SO MUCH TO DECIDED. The more I learn, the more I realise I dont know much at all about this. Its $1395USD but it includes the controller, a THC unit, the plasma screen software AND a Mach4Hobby licence. So its not cheap but is still good value. Howdy Damo, How did you go with the plasma? I am following this thread as I am going to build or buy a table. I am planning to go and visit RodW in Archerfield - sounds like he is pretty experienced. Let us know please.